Oregon Gov. Kate Brown is scheduled to speak before the 2018 Oregon Leadership Summit on Dec. 3. 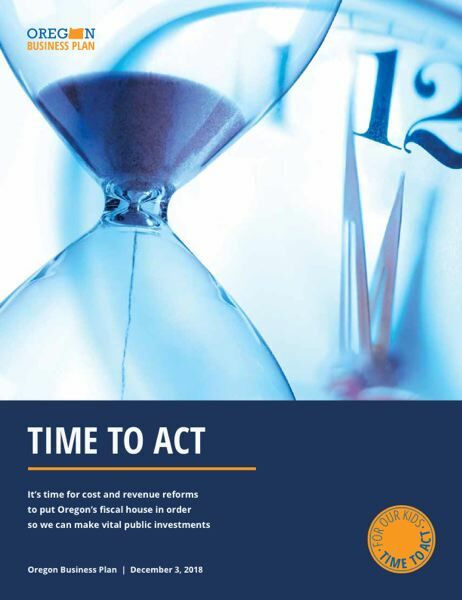 Three business organizations say the 2019 Oregon Legislature should raise personal and corporate taxes — if lawmakers also rein in the cost of benefits to public employees. The offer is extended n the 2018 Oregon Business Plan, which was drafted by the Oregon Business Council, Oregon Business and Industry and the Portland Business Alliance. It was the centerpiece of the 2018 Oregon Leadership Summit held Monday morning at the Oregon Convention Center. The most recent version of its annual proposed state business blueprint looks favorably at the Legislature diverting state "kicker" tax refunds into a reserve fund and enacting a "business activities tax" on corporate revenues, minus purchases from other firms. But, the plan said, such revenue increases will do little good unless the Legislature also curtails projected Public Employee Retirement System premium increases that will consume much of them. According to the plan, the PERS burden is expected to double over the next four years. "Oregonians should not experience rising taxes and prices simply to pay for added PERS costs," says the plan, which also calls state employee health care costs too high. Although Democratic Oregon Gov. Kate Brown is scheduled to speak at the summit, it is unclear how she will respond to the offer. At first glance, Brown and her party would seem to have a mandate to do whatever they want at the session that begins on Jan. 22. She beat Republican state Rep. Knute Buehler by 50 to 44 percent at the Nov. 6 general election. And Democrats won three-fifth's "supermajorities" in both the Oregon House and State Senate at the election, giving it the authority to raise taxes without the support of any Republicans. But the Legislature needs to approve a huge tax increase to fully fund Brown's proposed budget for the next two years — $2 billion, the largest jump in state spending ever considered in Salem. Brown did not say how that much additional evenue should be raised, leaving for the Legislature to decide. But approving such an increase without any Republican support is politically risky. House Republican Leader Carl Wilson (R-Grants Pass) has already signaled he's prepared to make a campaign issue out of it. "This is not a challenge to the Legislature. It is a challenge to the wallets and pocketbooks of hardworking Oregonians. This is a call to drastically increase taxes on everyday Oregonians," Wilson said after Brown released her proposed budget on Nov. 28. Despite the qualifications in the plan, the business leaders at the summit found much to like in Brown's proposed budget. Like all previous plans, the 2018 version called for more state spending on education, lamenting the property tax limitations imposed on schools by the state voters when they approved Measure 5 and Measure 50 many years ago. When she presented her budget, Brown urged lawmakers to pass a tax overhaul "to adequately fund our education system." Overall, she wants to spend $13.7 billion on education in the next two years. Of Brown's proposed $2 billion boost, the largest single share — about $926 million — would go to K-12 schools to extend the school year, reduce class sizes and fully fund a measure passed by Oregon voters in 2016 to offer more career and technical education. About $368 million would go to pay for day care and early childhood education, which her office said would prepare kids for kindergarten and give them social and academic skills to do well in elementary school and beyond. And as college costs climb and graduates continue to struggle with student loans, $590 million would go to universities and community colleges to prevent tuition increases of more than 5 percent and would double state grants for low-income students who want to go to college. "We need to invest boldly. Oregon has set a goal that 40 percent of Oregon students will attain a four-year degree or more, that another 40 percent will attain an associate degree or meaningful certificate, and that every Oregonian will attain a high school diploma or equivalent. The Business Plan has long supported this goal, recognizing that acquisition of knowledge and skills is essential for all or our citizens to succeed in work and life," the 2018 plan says. The 2018 Oregon leadership Summit begins at 8:30 a.m. on Monday, Dec. 3, at the Oregon Convention Center. You can read the 2018 Oregon Business Plan here. Oregon Capital Bureau reporter Aubrey Wieber contributed to this story.